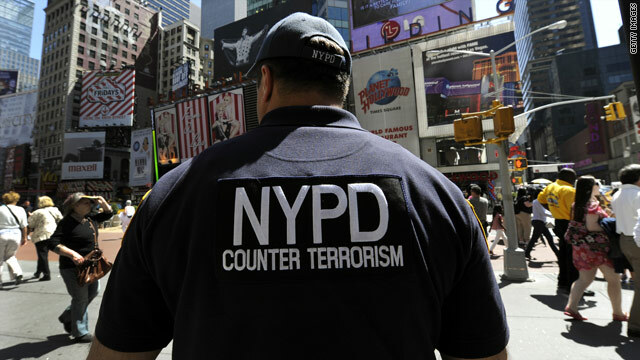 A New York City Police Department Counter Terrorism Unit officer patrols Times Square. Attorney-General says rules need to be "flexible, more consistent with the threat we face"
'You have the right to remain silent. Anything you say can and will be used against you in a court of law..."
That world-famous American warning to criminal suspects about their constitutional rights may be about to change. Sixteen months after taking office and inheriting the Bush administration's war on terror, Barack Obama may be turning out just as tough as his predecessor. He's pulled back from his pledge to close Guantanamo Bay prison in Cuba, maintained Bush war policy in Iraq, escalated the effort in Afghanistan and authorized ongoing drone attacks in Pakistan as well. Even so, some Republicans deride the Obama administration as weak on national defense and say its treatment of terrorism suspects is proof. Under Obama, suspects arrested in the U.S. have been reminded of their rights. But then a Pakistani-American immigrant was arrested last week in connection with a failed plot to bomb New York's Times Square. Police immediately questioned Faisal Shahzad about whether there was any other pressing threat to public safety. Satisfied that the danger was past, they then read him his rights and reminded him he could remain silent. Some legal experts say that the initial questioning may have violated Shahzad's constitutional rights and threatened the government's ability to convict him in court. The incident apparently impressed the administration. Obama's aides announced he would be working on potential changes to the long-standing policy. "We have to think about perhaps modifying the rules that interrogators have," said Attorney-General Eric Holder, "coming up with something that is flexible and is more consistent with the threat that we now face." In George Bush's home state of Texas, one sarcastic newspaper headline announced that "Holder Discovers Terrorism." But reaction elsewhere has been muted. Civil libertarians oppose any effort to diminish the rights of criminal suspects but may be waiting to see what Obama actually proposes. To most law-abiding citizens in the United States and around the world, the most noticeable change may be in the cop shows they watch on TV.